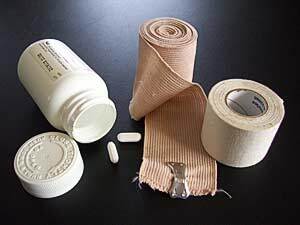 “Old injuries” are common in many athletes and martial artists. Joints, in particular, do not always heal well from trauma or surgery. Often old injuries haunt athletes with stiffness and dull pain. These injuries are often not enough to stop the athlete, but they do slow the athlete down and impair performance. From a Chinese medical perspective, when an injury lingers and continues to produce pain it is seen as an incomplete healing of the injury. Traditional treatment starts with understanding why the injury is not completely healed, and how to help the body repair as much damage as possible. Pain and other symptoms are signs and indications about the nature of body functioning. Pain is not the enemy, but rather an indicator that something is wrong. Dull achy types of pain can indicate that an injury did not heal well. There are many reasons why a trauma may not heal well. Joint and connective tissue tends to heal slower due to a low perfusion of blood compared to muscle tissue. Sometimes the rate of re-injury exceeds the ability of the body to heal. This can come from overuse of the joint or simply poor health and age. Environment, nutrition and severity of the original injury also play a role. In Traditional Chinese Medicine (TCM) incompletely healed injuries are called a Bi (pronounced “bee”) syndrome. The term Bi does not translate well, but refers to a broad class of medical conditions often involving chronic pain. Arthritis, gout and tennis elbow are just a few of the situations that often fall under the category of Bi syndrome. Indications: Marked by various types of pain that tend to move around the body. The pain seems to come and go at random, a pain in a joint one day, headache on the side of the head the next. Often there is stiffness of the neck, and often the patient naturally avoids wind and drafts. Treatment: Responds well to herbal formulas that calm wind type symptoms and nourish the body to strengthen the healing process. Acupuncture can be helpful. It is also recommended that the patient dress in protective clothing to avoid wind and drafts that can aggravate the pain. Sometimes the severity of a case of Wind Bi is tied to over training. In that case an extended period of lighter, less exhausting workouts is recommended. Topical: Keep injured area protected from the environment. Indications: The patient experiences localized fixed pains that do not move. The pain has a heavy dull nature to it. Limbs that are affected feel heavy and weak. Sometimes there is a feeling of trapped fluid, puffiness, or edema at the location of the pain. The patient often feels tired and sluggish, particularly during humid, wet weather. Treatment: Can be relieved with herbs that are aromatic and drying. Moxibustion (an acupuncture technique that utilizes heat) is also very helpful in reducing the pain and speeding the healing process by “drying” the injury. Heat applied daily to the area can also help. Topical: Use sports rubs that contain aromatic musk and camphor. Food: Sugar and greasy foods will increase this type of pain and should be avoided. Increase aromatic spices like cardamom, turmeric and curry in the diet. Indications: Presents as a sharp, tight, stiff type of pain. It feels better with the application of heat and movement. There is no redness or swelling to the injured area. Cold Bi sometimes results from frostbite or a sports injury that was excessively iced. Treatment: Can be relieved by the regular application of heat in the form of heat lamps, pads, or moxibustion. Applying heat daily, regardless of the level of pain helps the injury to heal and gain in strength. There are many classic herb formulas containing hot herbs. Some are more drying for combination damp and cold Bi and some are just hot. Topical: Liniments that contain capsicum/hot chili can be helpful. Food: Add hot peppers, cinnamon and yellow spices like ginger, mustard, and garlic to the diet. Indications: Marked by a chronic redness and warmth at the site of the pain. This is different from acute tenderness and swelling immediately after the trauma. Pain varies, but feels worse with the application of heat. Treatment: Herbal formulas are prescribed to clear heat and the damp that often accompanies hot Bi. TCM views ice as being useful in controlling pain, but counterproductive in helping the body to heal. This is due to the way ice constricts the flow of much needed blood and delays tissue repair. Topical: Use liniments that are cooling in nature. They will contain menthol, mint (like wintergreen), rhubarb or dandelion. Food: Increase dark green vegetables and seaweeds as well as dark berries (cherries, blueberries etc.) in the diet. In practice, Bi syndromes often manifest in combinations. Patients often present with cold and damp, or wind and cold, with one dynamic being predominant. The symptoms provide a way for the body to indicate what type of treatment is needed to help the body to heal. Many people treat these types of pain with increasing amounts of over-the-counter analgesics. While these analgesics reduce the pain they are not designed to help the injury to heal. In many cases, decreasing the pain allows the patient to cause more damage to the injured area. The focus in TCM is to utilize treatments that can help the body to heal, which in turn will reduce the pain. None of these treatments can change the structure of the body. Only the body itself can rebuild tissue. These treatments do however help the body to heal as much as possible and decrease the pain while increasing the functionality of the tissue involved. David Bock, C.Ac. Dipl.OM, FABORM, is a Wisconsin Certified Acupuncturist, NCCAOM National Board Certified in Acupuncture and Chinese Herbology. He is a teacher of Wadokai Aikido (under Roy Suenaka Sensei) and author of the online column “Milwaukee Natural Health Examiner”. He can be reached at www.hartlandorientalmed.com. David is a regular contributor to FightingArts.com.